Your invitation to a Twitter party! Good morning folks and happy Monday! Not so happy? I know it’s all rainy and miserable plus it’s a full five day week (boo) but I do have something to cheer you up. A couple of weeks ago, I did a one week style challenge using the Weight Watchers Ultimate Weight Loss Wardrobe and this week, we have a super fun Twitter party organised for you! The fabulous Louise Roe, gorgeous Tor from Fab Frocks and I will be hosting the party from 7-8pm this Thursday so keep it free! We’re going to talk to you about all things fashion from dressing for your body type to how to wear the latest trends. 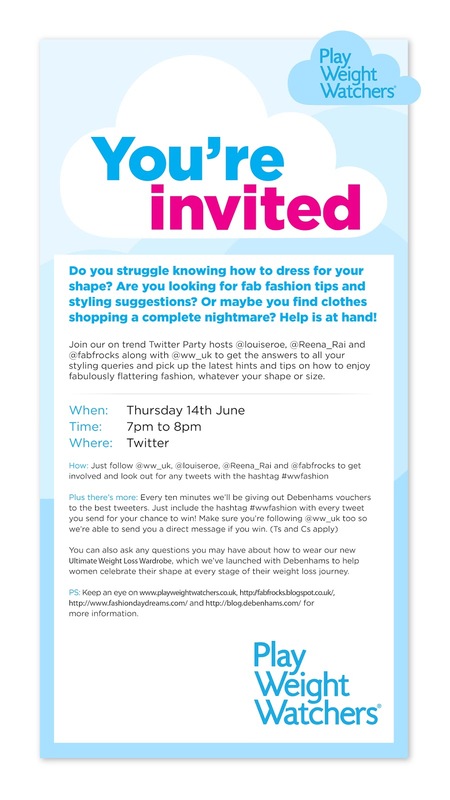 We will also be giving away from fantastic vouchers from Debenhams during the chat, what could be better than a little guilt-free retail therapy?! Keep this Thursday free and check out the invitation below for all of the details. Don’t forget to get involved by using the hashtag #wwfashion. Follow me on Twitter for reminders and of course the all important Twitter party.